Over the long weekend, my friend and I went out to shop around for skin care products. Girls are usually more aware of the changes on the skin. My friend is approaching 30 so she’s very self-conscious of the dehydration lines, marionette lines, and potentially sagging jaw line. I love shopping. But deciding what to buy is a huge challenge. Finally, we set off on our journey of “finding youth” (oh no, it’s not finding Nemo). We checked every cosmetic brand counter and gathered a lot of information of each anti-aging products. Finally, after a long tour, we had our eyes on Kiehl’s. Smart skincare without breaking the bank! My friend bought a whole set as they have a promotion going on. Myself, I got some little samplers to try at home. One that particularly stood out to me is Midnight Recovery. To me, it’s a genie in a bottle. I used up an entire bottle before, but I am always on the search of the next best thing so I didn’t replenish my Midnight Recovery stock. I tried many others to help boost skin hydration and sebum/water balance. So far I’ve had no success lol. 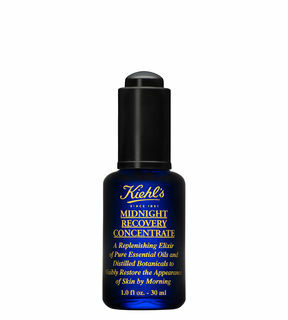 I came back to Midnight Recovery in the end – in the sample form. The correct application method is to rub 1-2 drops of the serum onto your balm so the serum will be activated by the warm temperate of your hands. Then pat it onto your face and neck area. Wait 3 minutes for it to be absorbed, then slab on your regular skincare products afterwards. I tried it last night. This morning, I woke up feeling amazing. My skin had less bumps and less congestion -> smoother complexion (though I totally stayed up the night before until 12am) which I was very impressed. Definitely worth a try! The only caveat is that what works for me may not work for you. After all, we were not born the same (or it will be an ultra boring world lol) but definitely don’t miss any of my recommended goodies ❤ happy skincare shopping. Next((Makeup)) Neat Eye Makeup !